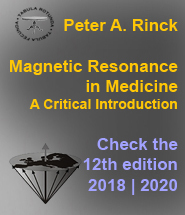 20-03 | The history of MR imaging | MRI NMR Magnetic Resonance • Essentials, introduction, basic principles, facts, history | The primer of EMRF/TRTF. Finding a relevant use of this new technique was difficult, and medicine and bio­logy stayed somewhere backstage although in vivo NMR with a medical back­ground has its roots in the early and mid-1950s. In 1955 Erik Odeblad (Figure 20-15) and Gunnar Lindström from Stock­holm published their first NMR stu­dies, including relaxation time mea­su­re­ments of living cells and excised animal tissue [⇒ Odeblad 1955]. Odeblad is the main pioneer in NMR in medicine and laid the foundations of NMR and MRI in biomedicine. 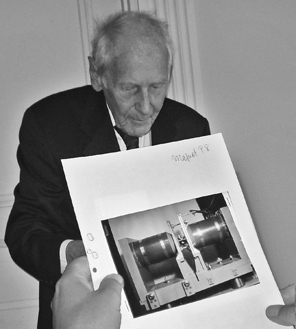 Erik Odeblad, recalling his first NMR spec­tro­me­ter after receiving the European Magnetic Resonance Award 2012. In 1952, while working at the University of California in Berkeley Odeblad met Fe­lix Bloch in Stanford. He asked him whether he could use Bloch's NMR spec­tro­me­ter to study human samples, but the response was negative: NMR was a tool for phy­si­cists, not for research into physiology, medicine, or biology. Odeblad returned to Sweden – and got his own machine. Around 1950 Gunnar Lindström of the Nobel Institute of Physics in Stockholm had built a spec­tro­me­ter. Odeblad adapted and used it for his pioneering biomedical NMR ap­pli­ca­tions, in vivo and ex vivo. In December 1954, they submitted their first NMR results (Figure 20-16a). They had found out that different tissues had distinct relaxation times, most likely due to water content but also to different bindings to lipids – a phe­no­me­non that explains tissue contrast in MR imaging. Odeblad continued working on human fluids and tissues throughout the following decades and some sixty sci­en­ti­fic pa­pers on NMR in human tissues and secretions of mucous membranes followed bet­ween 1955 and 1968 (Figure 20-16b) [⇒ Odeblad 1957]. 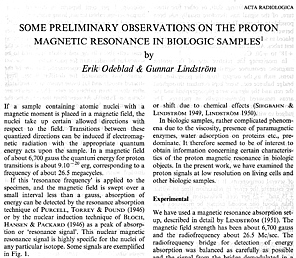 The first paper on biological and medical NMR: "Some preliminary observations on the proton magnetic resonance in bio­lo­gi­cal samples", by Erik Odeblad and Gun­nar Lindström, submitted for publication to Acta Radiologica (Stockholm) in De­cem­ber 1954, published in 1955. 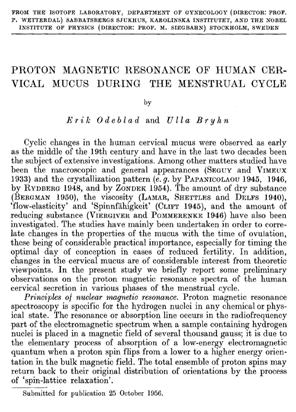 A paper published two years later: "Proton magnetic resonance of human cervical mucus during the menstrual cycle", Acta Radiologica (Stockholm) 1957. 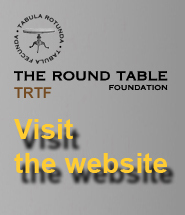 Again, the research for this publication was performed at the Department of Obstretics and Gynecology at the Sabbatsberg Hospital, Karolinska Institute, and the Nobel Institute of Physics in Stockholm. Later Odeblad left Karolinska for, what is claimed, reasons of conscience and became Professor of Medical Biophysics at the new University of Umeå in northern Sweden. Erik Odeblad: The forgotten pioneer. Others joined in this kind of research. 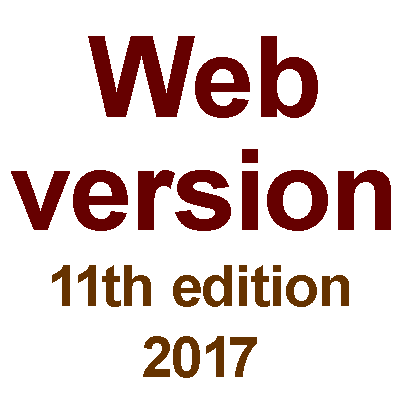 Oleg Jardetzky and his collaborators per­form­ed sodium NMR studies in blood, plasma and red blood cells in 1956 [⇒ Jardetzky]. T1- and T2-measurements of living frog skeletal muscle were pub­li­shed by Brat­ton in 1965 [⇒ Bratton]. In the 1960s and 1970s the results of a very large amount of work on relaxation, diffusion, and chemical exchange of water in cells and tissues of all sorts appeared in the scientific literature. In 1967, Ligon reported the measurement of NMR relaxation of water in the arms of living hu­man subjects [⇒ Ligon]. In 1968, Jackson and Langham published the first NMR signals from a living animal [⇒ Jackson]. In the late 1960s, Jim Hutchison at the University of Aberdeen in Scotland be­gan working with magnetic resonance on in vivo electron spin resonance studies in mice. Hazlewood added to the work on NMR relaxation time measurements by studying developing muscle tissue [⇒ Hazlewood 1969; 1971]. Cooke and Wien work­ed on similar topics [⇒ Cooke]. Hansen focussed upon NMR studies of brain tissue [⇒ Hansen]. The research groups of Raymond Damadian at Downstate Medical Center in Brooklyn and of Donald P. Hollis at Johns Hopkins University in Baltimore got involved in the early 1970s. Damadian's group measured relaxation times of ex­ci­sed normal and cancerous rat tissue and stated that tumorous tissue had lon­ger relaxation times than normal tissue [⇒ Damadian 1971]. It was a fallacious con­clu­sion. 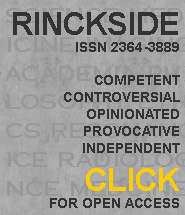 Independent verification could not be provided by other scientists; the results were not reproducible. 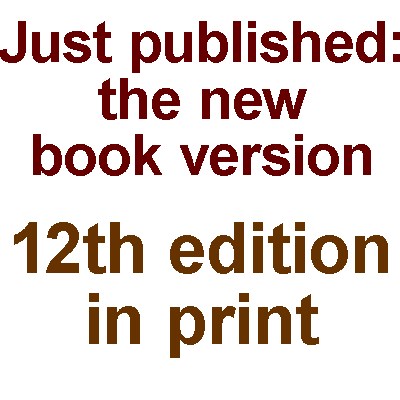 Donald Hollis and his colleagues reached conflicting results on the same NMR spectrometer Damadian used. They were more balanced and scientifically cri­ti­cal and did not jump to wrong conclusions [⇒ Hollis]. Still, Damadian promoted his findings as the ultimate technology to screen for ("scan" – but not image) can­cer and patented the idea of a hypothetical relaxation time scanner as Ap­pa­ra­tus and method for detecting cancer in tissue [⇒ Damadian 1974] (Figure 20- 17c). He never mentioned Odeblad's original findings although he admitted that he was well aware of them. Damadian was scientifically and medically wrong in his cancer-scanning pa­tent and later his one-dimensional spot-by-spot picture technique (once de­scrib­ed as "the best advertised scientific scam of the 20th century"). However, his pu­bli­ci­ty stunts, exaggerated and colorful self-promotion, and massive ad­ver­tis­ing cam­paigns for his company made people curious and impacted research in NMR du­ring the following decade [review articles: ⇒ Harris; ⇒ Hollis; ⇒ Kleinfeld]. The New York Times (NYT) pointed out major discrepancies between what he claimed and what he had actually accomplished, "discrepancies sufficient to make him appear a fool if not a fraud" [⇒ Fjer­me­dal NYT]. Damadian was, as it happens so often in the history of inventions, one of the many who prepared the ground – even if he was conclusively disproved. In February 1973 Zenuemon Abe and his colleagues applied for a patent on a tar­ge­ted NMR scanner [⇒ Abe] (Figure 20-17b). They published this technique in 1974 [⇒ Tanaka]. Damadian reported a similar technique in a publication two years la­ter, dubbed 'field-focusing NMR (Fonar)' which contained an image com­bin­ed of one-dimensional measurements: step-by-step scanned volume elements through a mouse [⇒ Damadian 1976]. Neither Abe's nor the Fonar techniques were suitable for medical imaging. Damadian's company later used the MR imaging method described by Paul Lauterbur who in 1976 had al­ready published an in vivo image of a mouse highlighting tumorous tis­sue [⇒ Lauterbur 1976]. The attribution that Damadian made the first proposal for an MR imaging device, repeated time and again, is historically not correct. Graphic designs of three patented though inapplicable magnetic-field-based dia­gnos­tic systems. All systems were one-di­men­sio­nal and not conceived as imaging equip­ment. Artist's rendering published in the New York Times on 9 February 1974. 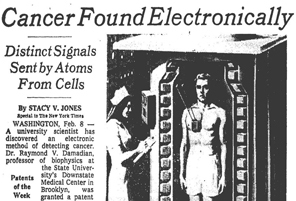 A subsequent New York Times comment stated: "Dr. Damadian later retracted a contention that his technique had already been used to discover cancerous tissue in a living patient." 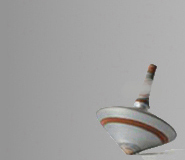 How a scam propelled science: "Relaxation times blues." Flow measurements by NMR date back as far as 1951 when the first ex­pe­ri­ment using continuous wave (CW) NMR was described by Suryan [⇒ Suryan]. 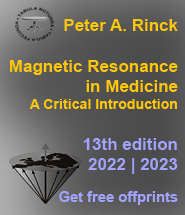 By 1959, Jay Singer had studied blood flow by NMR relaxation time mea­su­re­ments of blood in living humans [⇒ Singer]. Such measurements were not in­tro­duc­ed into common medical practice until the mid-1980s, although patents for similar ideas were filed earlier, for instance for an NMR machine to measure blood flow in the human body by Alexander Ganssen in early 1967 [⇒ Ganssen]. This machine was meant to measure the NMR signal of flowing blood at dif­fe­rent locations of a vessel with a series of small coils, allowing to calculate the blood flow within that vessel. 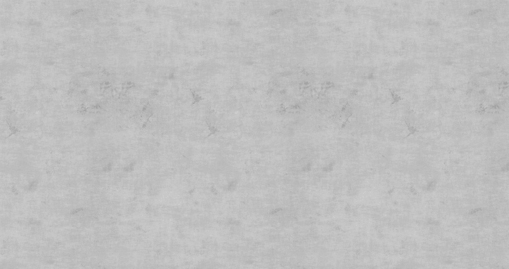 It could be described as an MR scanner (Figure 20-17a). However, it was no MR imaging machine. 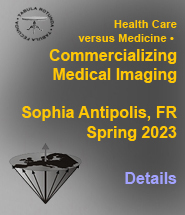 Chapter 20 | The history of MR imaging – Page 3  Go to Chapter 20, page 1, 2, 3, 4, 5, 6, 7, 8, 9, 10.